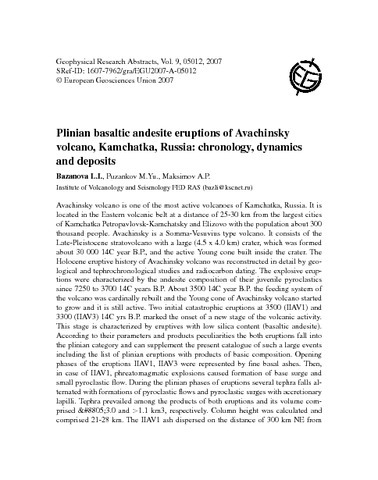 We present a new dataset for whole-rock major, trace, isotopic, and phenocryst compositions indicating a genetic link between andesites of the Holocene eruptions of the Bezymianny stratovolcano (the Bezymianny stage), the andesitic to dacitic Late Pleistocene lava dome complex (the pre-Bezymianny stage), and the magnesian to high-alumina basalts of the adjacent Kliuchevskoi Volcano. We demonstrate that volcanic products from the Bezymianny stage of volcano evolution are most likely the products of magma mixing between silicic products of the earliest stages of magma fractionation and the less evolved basaltic andesite parental melts periodically injected into the magma reservoir. 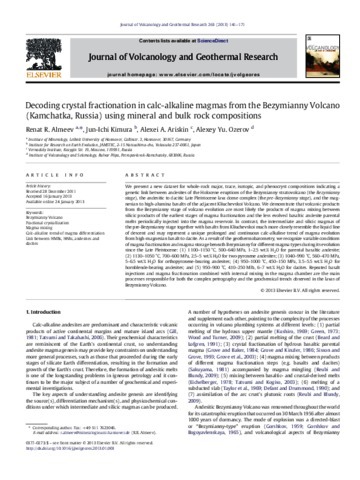 In contrast, the intermediate and silicic magmas of the pre-Bezymianny stage together with basalts from Kliuchevskoi much more closely resemble the liquid line of descent and may represent a unique prolonged and continuous calc-alkaline trend of magma evolution from high-magnesian basalt to dacite. As a result of the geothermobarometry, we recognize variable conditions of magma fractionation and magma storage beneath Bezymianny for different magma types during its evolution since the Late Pleistocene: (1) 1100–1150 °C, 500–640 MPa, 1–2.5 wt. H2O for parental basaltic andesite; (2) 1130–1050 °C, 700–600 MPa, 2.5–5 wt. H2O for two-pyroxene andesites; (3) 1040–990 °C, 560–470 MPa, 5–6.5 wt. H2O for orthopyroxene-bearing andesites; (4) 950–1000 °C, 450–150 MPa, 3.5–5.5 wt. H2O for hornblende-bearing andesites; and (5) 950–900 °C, 410–250 MPa, 6–7 wt. H2O for dacites. Repeated basalt injections and magma fractionation combined with internal mixing in the magma chamber are the main processes responsible for both the complex petrography and the geochemical trends observed in the lavas of Bezymianny Volcano. The 1800 14C yr BP Ksudach KS1 rhyodacite deposits present an opportunity to study the effects of caldera collapse on eruption dynamics and behavior. Stratigraphic relations indicate four Phases of eruption, Initial, Main, Lithic, and Gray. Well-sorted, reverse-graded pumice fall deposits overlying a silty ash compose the Initial Phase layers. The Main, Lithic, and Gray Phases are represented by pumice fall layers interbedded with pyroclastic flow and surge deposits (proximally) and co-ignimbrite ashes (distally). Although most of the deposit is <30 wt.% lithics, the Lithic Phase layers are >50 wt.% lithics. White and gray pumice are compositionally indistinguishable, however vesicle textures and microlite populations indicate faster ascent by the white pumice prior to eruption of the Gray Phase. The eruption volume is estimated as ∼8.5 km3 magma (dense rock equivalent) and ∼3.6 km3 lithics. Isopleth maps indicate mass flux ranged from 5–10×10^7 kg/s during the Initial Phase to >10^8 kg/s during the Main, Lithic, and Gray Phases. Caldera Collapse during the Lithic Phase is reflected by a large increase in lithic particles and the abrupt textural change from white to gray pumice; collapse began following eruption of ∼66% of the magma, and finished when ∼72% of the magma was erupted. Stratigraphic, granulometric, and component analyses indicate simultaneous eruption of buoyant plumes and non-buoyant flows during the Main, Lithic, and Gray Phases. Although mass flux did not change significantly following caldera collapse, the Gray Phase of eruption was dominated by non-buoyant flows in contrast to the earlier Phases that erupted mostly buoyant plumes. Caldera collapse changes volcanic eruption behavior and mass flux. Many models of caldera formation predict that those changes in eruption dynamics result from changes in conduit and vent structure during and after collapse. Unfortunately, no previous studies have quantified or described how conduits change in response to caldera collapse. Changes in pumice texture coincident with caldera formation during the 1800 14C yr BP KS1 eruption of Ksudach Volcano, Kamchatka, provide an opportunity to constrain magma decompression rates before and after collapse and thus estimate changes in conduit geometry. Prior to caldera collapse, only white rhyodacite pumice with few microlites and elongate vesicles were erupted. Following collapse, only gray rhyodacite pumice containing abundant microlites and round vesicles were erupted. Bulk compositions, phase assemblages, phenocryst compositions, and geothermometry of the two pumice types are indistinguishable, thus the two pumice types originated from the same magma. Geothermobarometry and phase equilibria experiments indicate that magma was stored at 100–125 MPa and 895 ± 5 °C prior to eruption. Decompression experiments suggest microlite textures observed in the white pumice require decompression rates of > 0.01 MPa s− 1, whereas the textures of gray pumice require decompression at ~ 0.0025 MPa s− 1. Balancing those decompression rates with eruptive mass fluxes requires conduit size to have increased by a factor of ~ 4 during caldera collapse. Slower ascent through a broader conduit following collapse is also consistent with the change from highly stretched vesicles present in white pumice and to round vesicles in gray pumice. Numerical modeling suggests that the mass flux and low decompression rates during the Gray phase can be accommodated by the post-collapse conduit developing a very broad base and narrow upper region. Ariskin A.A., Barmina G.S., Ozerov A.Yu., Nielsen R.L. 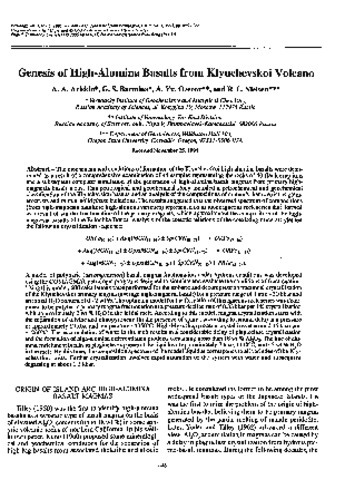 Genesis of High-Alumina Basalts from Klyuchevskoi Volcano // Petrology. 1995. V. 3. № 5. P. 449-472. 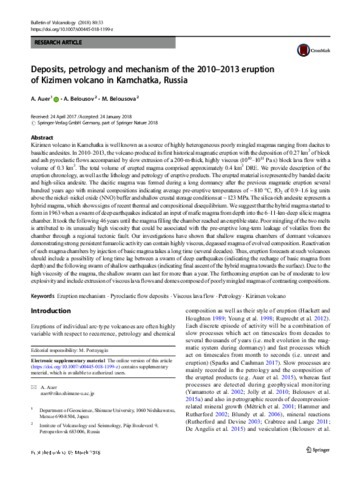 Auer A., Belousov A., Belousova M. Deposits, petrology and mechanism of the 2010–2013 eruption of Kizimen volcano in Kamchatka, Russia // Bulletin of Volcanology. 2018. V. 80. № 33. Klyuchevskoy volcano, in Kamchatka’s subduction zone, is one of the most active arc volcanoes in the world and contains some of the highest δ18O values for olivines and basalts. We present an oxygen isotope and melt inclusion study of olivine phenocrysts in conjunction with major and trace element analyses of 14C- and tephrochronologically-dated tephra layers and lavas spanning the eruptive history of Klyuchevskoy. Whole-rock and groundmass analyses of tephra layers and lava samples demonstrate that both high-Mg (7–12.5 wt% MgO) and high-Al (17–19 wt% Al2O3, 3–6.5 wt% MgO) basalt and basaltic andesite erupted coevally from the central vent and flank cones. Individual and bulk olivine δ18O range from normal MORB values of 5.1‰ to values as high as 7.6‰. Likewise, tephra and lava matrix glass have high-δ18O values of 5.8–8.1‰. High-Al basalts dominate volumetrically in Klyuchevskoy’s volcanic record and are mostly high in δ18O. High-δ18O olivines and more normal-δ18O olivines occur in both high-Mg and high-Al samples. Most olivines in either high-Al or high-Mg basalts are not in oxygen isotopic equilibrium with their host glasses, and Δ18Oolivine–glass values are out of equilibrium by up to 1.5‰. Olivines are also out of Fe–Mg equilibrium with the host glasses, but to a lesser extent. Water concentrations in olivine-hosted melt inclusions from five tephra samples range from 0.4 to 7.1 wt%. Melt inclusion CO2 concentrations vary from below detection (<50 ppm) to 1,900 ppm. These values indicate depths of crystallization up to ~17 km (5 kbar). The variable H2O and CO2 concentrations likely reflect crystallization of olivine and entrapment of inclusions in ascending and degassing magma. Oxygen isotope and Fe–Mg disequilibria together with melt inclusion data indicate that olivine was mixed and recycled between high-Al and high-Mg basaltic melts and cumulates, and Fe–Mg and δ18O re-equilibration processes were incomplete. Major and trace elements in the variably high-δ18O olivines suggest a peridotite source for the parental magmas. Voluminous, highest in the world with respect to δ18O, and hydrous basic volcanism in Klyuchevskoy and other Central Kamchatka depression volcanoes is explained by a model in which the ascending primitive melts that resulted from the hydrous melt fluxing of mantle wedge peridotite, interacted with the shallow high-δ18O lithospheric mantle that had been extensively hydrated during earlier times when it was part of the Kamchatka forearc. Following accretion of the Eastern Peninsula terrains several million years ago, a trench jump eastward caused the old forearc mantle to be beneath the presently active arc. Variable interaction of ascending flux-melting-derived melts with this older, high-δ18O lithospheric mantle has produced mafic parental magmas with a spectrum of δ18O values. Differentiation of the higher δ18O parental magmas has created the volumetrically dominant high-Al basalt series. Both basalt types incessantly rise and mix between themselves and with variable in δ18O cumulates within dynamic Klyuchevskoy magma plumbing system, causing biannual eruptions and heterogeneous magma products. Averiev V.V., Ivanov V.V., Piip B.I. Problems of using volcanic thermae of the Kurile-Kamchatka Island arc for Power // Bulletin of Volcanology. 1960. V. 23. № 1. 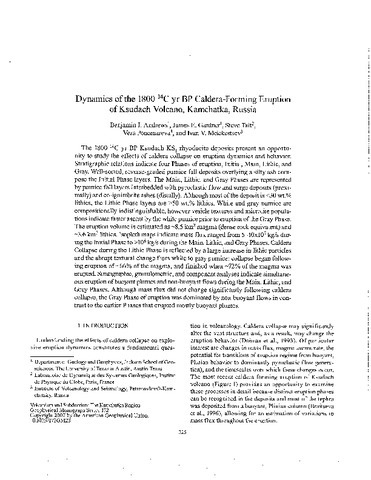 P. 257-263. doi: 10.1007/BF02596653. There are reported gas chromatography, gas chromatography/mass spectrometry and carbon isotopic data on the oils sampled in caldera of the Uzon volcano (East Kamchatka). The Uzon volcano is located in the west of the eastern Kamchatka basin which is made up of thick Paleogene-Neogene sedimentary rocks. Its caldera is made up of lacustrine volcanogenic-sedimentary formations of Pleistocene age (38–70 thousand years), lying on dense basalts. Two samples studied were heavy oils (0.915 g/ml) and contained 2 sulfur; 2.5 paraffin, 9.3 waxes; 1.4 wt olefinic hydrocarbons. Their gas chromatograms show a mono-modal distribution for n-alkanes with a maximum at C18. Pristane/Phytane concentration ratios were measured to be 0.48–0.52. Olefinic hydrocarbons were interpreted to be of hydrothermal origin. Sterane and triterpane biomarkers indicated a low maturation degree and a lacustrine orgin of the initial organic matter. The Uzon oil was found to be isotopically heavy with a δ13C value of −21‰14C isotope was detected, which indicates that recent plant organic matter was significantly involved in oil generation process.